Upgrade works on the Moyston-Dunkeld Road bridge is nearing completion. One of the new bridge's culverts is craned into position. A section of the road, which was closed during construction, will be re-opened to traffic in early October, in time for the region’s peak tourism period. North East Civil Construction, which was awarded the tender earlier this year, commenced the upgrade work on August 21 and is scheduled for completion on time by the end of the week. 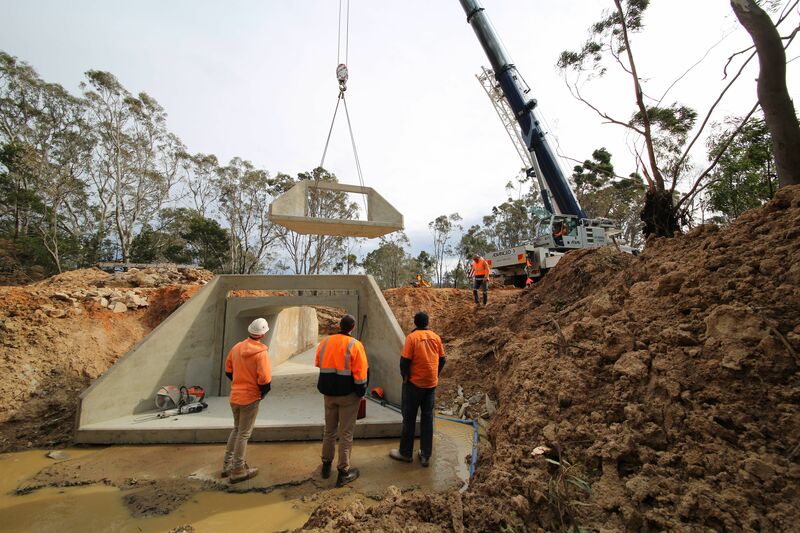 Work included widening of the bridge to double lane (7.6 metres) to improve safety and the installation of new guard rails, along with culverts which were craned into position and rock beaching in the creek for erosion control. The bridge was identified by Ararat Rural City Council as a required site for upgrading as part of the municipality’s Bridge and Roads Renewal Program.